Explore the historic center of Mexico City while meeting people from all over the planet. Selina Mexico City offer you a unique, purpose-filled and enriching experience. Our urban art, and unique ecofriendly details in each common spaces and rooms will infect you with good vibes. The work-life balance. We’ve found the ideal harmony between creativity, tranquility, and productivity, creating the perfect ecosystem for Digital Nomads and traveling innovators. We have a playground for you, to make friends, where you can share a delight cocktail or conversation. An enchanting city that has a lot to offer, with a rich and varied cultural life, a beautiful historic center and tasty gastronomy, known as the Centro or Centro Histórico, is the central neighborhood in Mexico City, Mexico, focused on Zócalo or main plaza and extending in all directions for a number of blocks, with its farthest extent being west to the Alameda Central. Its colonial and European architecture and narrow cobblestone streets set it apart from the rest of Mexico City. Our suites will delight those who seek the comfort of a fancy hotel, while our standard rooms are perfect for those looking for respite from the social blast of the communal areas. Those on a budget can choose from the dorms the best form to meet people. In addition, we have several common areas where the guests and the travellers can get together and exchange past experiences and future plans. If you arrive earlier you'll be more than welcome to chill in the common spaces, have some breakfast, use all of our facilities or just store your luggage with us and go exploring town while you wait for your room to be ready. We will keep your bags for free (after the check out) all day long if you need. Our restaurant is open from 7am to 11pm. We also have a common kitchen that you can use every time. We are pet friendly. Your pet is more than welcome as long as you stay in a private room or in a whole dorm reserved for yourself. We will charge $10 per night/per pet at check in. 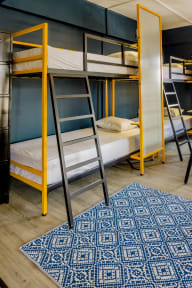 Hostel com ótimo preço para dormir, muito bem organizado e com uma ótima estrutura. O restaurante tem preços acima dos que se costuma pagar na região, mas a comida é bem gostosa. Ótimo ambiente, organizado, mas um pouco caro para mochileiros. 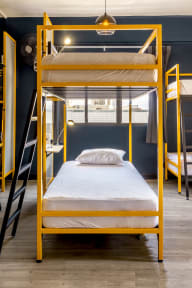 Potem proposta do hostel ou hotel ou coowork rs é diferente. Ótima localização. The room was very clean, but the building is old so the floor slightly bounced and the lockers made noise. Otherwise the accommodation was good. There was an attendant that was not very polite, and charged us the wrong amount for the room keys. Breakfast did not have many options but it was good. O elevador estava quebrado e nos colocaram no último andar. Tínhamos viajado por 20 horas e estávamos cansados, ao chegar no quarto tentamos ligar o ventilador mas ele não funcionava. O andar por ser o último ficava bastante isolado, pois área comum era no 1º andar. Falamos com a equipe da recepção sobre o ventilador mas a menina da recepção não se mostrou solícita em nos ajudar. Como íamos ficar apenas dois dias e já havíamos pago, ficamos lá mesmo.